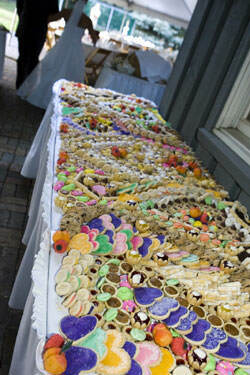 If you are from Pittsburgh, I am sure you have been to a wedding where the bride and groom have provided dozens and dozens of cookies for their guests. What you may not realize is that this tradition does not occur in most other areas of the country. IT’S A BURGH THING! 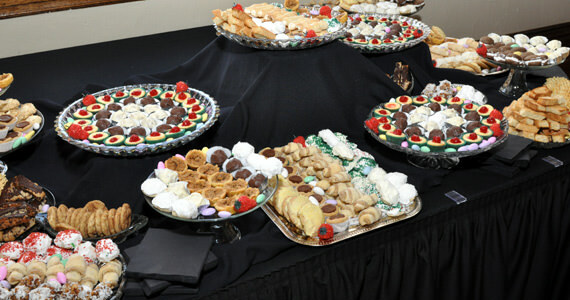 Below is an article from the New York Times, written by Ron Lieber, about the Pittsburgh cookie table tradition. The Wedding? I’m Here for the Cookies! Like brides and bridegrooms the world over, the ones in this city and nearby towns bask in the glory of the white dress, the big kiss and the first dance. But then, a large number of them happily cede the spotlight to a cookie. Or a few thousand of them. For as long as anyone here can remember, wedding receptions in Pittsburgh have featured cookie tables, laden with dozens of homemade old-fashioned offerings like lady locks, pizzelles and buckeyes. For weeks ahead — sometimes months — mothers and aunts and grandmas and in-laws hunker down in the kitchen baking and freezing. Then, on the big day, hungry guests ravage the buffet, piling plates high and packing more in takeout containers so they can have them for breakfast the next day. No one knows for sure who started the tradition, or why it hasn’t exactly taken hold outside this region. Many people credit Italian and Eastern European immigrants who wanted to bring a bit of the Old Country to the big day in the New World. Given that many of them were already well practiced at laying out a Christmas spread, baking 8 to 10 times as many treats for a few hundred special friends and relatives may not have seemed like such a stretch. But even amid the increasing professionalization of the wedding, with florists mimicking slick arrangements ripped from Martha Stewart’s magazines and wedding planners scheduling each event down to the minute, the descendants of those Pittsburgh settlers continue to haul their homemade cookies into the fanciest hotels and wedding venues around the city. For many families today, it would be bordering on sacrilege to do without the table. So on a rainy Saturday in early autumn, Laura Gerrero, her mother, her mother-in-law and two aunts gathered to bake in preparation for Ms. Gerrero’s wedding to Luke Wiehagen. Her mother, Pat, used to make apple and cherry pies for local stores, and her aunt Elaine Ford had recently overseen the creation of over 6,000 cookies for the 180 guests at her own daughter’s wedding. And presiding over the initial steering-committee meeting was Laura herself, a 26-year-old retail manager. The bride (and the bridegroom, if he’s interested) can veto recipe selections. Ms. Gerrero is not a huge fan of liquor or certain fruits in her sweets, so the peach cookies and rum balls fell off the list. Pizzelles, a waffle-like Italian cookie, are also essentially mandatory. The Gerrero wedding was to feature both chocolate and anise pizzelles, made two at a time on an electric press manufactured specifically for this confection. The work spread over every inch of Pat Gerrero’s kitchen and dining room, as the women filled the lady locks — log-shaped shells — with cream, pressed out spritz butter cookies, and kept an eye on the pizzelle iron. They pored over the working list of cookies. The range of flavors was important, they explained, but so was appearance. They soon realized there were no squares, so lemon bars were added. Pittsburgh doesn’t have an ironclad claim to the cookie table; there are some people in Youngstown, Ohio, who believe it started there. So the tale of the table may be more legend than documented history. Not every community adopted the tradition, either. Rabbis around town, for instance, note that they rarely see cookie tables. Assimilation, too, has taken its toll, with some families writing off the table as too ethnic or somehow common. But that’s not how the Gerreros saw it. Pat, the mother of the bride, comes from one of the city’s well-known families, the Rooneys, who own a controlling stake in the Pittsburgh Steelers of the National Football League. “Without a cookie table, there might have been a revolt,” she said. So the family was left instead to debate the finer points of cookie table etiquette. 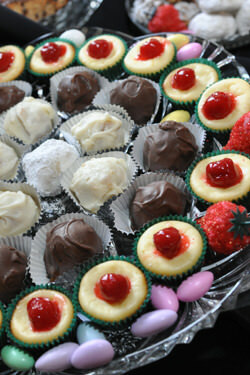 For instance, just how encouraging should the hosts be of those who want to pack a few dozen for later? As guests became more shameless, bringing in their own Baggies, host families adapted. The Gerreros decided to supply Chinese-food takeout boxes. Another key question involves whether the cookies should be on display when the party starts or saved for a big reveal. The problem with the former approach: it may encourage people to move shamelessly from the canapés straight to dessert. Children, in particular, have made a ritual of this. The bride’s sister, Nina Gerrero, thinks hosts ought to be tolerant of the behavior. “Eating cookies before you’re really supposed to is one of the most fun parts of a wedding,” she said. “I don’t consider it a dessert, though. The cake is the dessert, and the cookies are out there all day. That’s how it is on the holidays, too.” At her sister’s wedding, alas, the cookies were not to appear until the dinner hour. Finally, there is the bake-or-buy question. Some families cater the whole thing (and lie about it to the guests), while others will turn to professionals only for more labor-intensive cookies like pizzelles or lady locks. Wedding regulars in Pittsburgh have an eye for such things and whisper to other guests about it. But there was no such talk when Laura Gerrero’s wedding weekend arrived. On Friday, the various friends and relatives who had been baking pulled their cookies from tins and freezers around town and brought them to LeMont, her wedding site. There, a staff member spends much of Friday coordinating cookie arrivals, set-up and storage. On Saturday, Ms. Gerreros’s wedding planner, Simone Hudson, and her assistant spent about 90 minutes arranging the 2,000 or so cookies in various tiers. The florist came over to dress things up a bit. Then, they draped tablecloths over the 12-foot display to make sure no one nibbled or knocked anything over. Given that the die-hards come to eat and pack more for later, the host family always frets. “The biggest fear is that you’ll run out of cookies,” said Ms. Ford, Laura’s aunt. Instead, at the Gerrero wedding there was a different problem. So many people wanted to take the leftovers home that the family ran out of boxes.